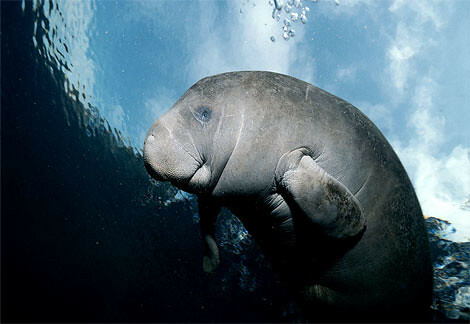 Many people know of manatees and their endangered status within Florida and the remainder of their range through the Caribbean basin. In 2007 the official Florida Fish and Wildlife count was 2,817. Manatees, the only herbivorous marine mammal, are affected by boat impacts, human encroachment and interactions, and habitat loss as seagrass beds and aquatic plants in estuaries and rivers are effected by pollution and water quality problems. Unfortunately, these concerns aren’t the only ones. The Manatee Rehabilitation Partnership in Florida tracks and assists post-release manatees that have undergone rehabilitation in human care and often need assistance to continue to thrive out in the wild. The MRP does a great job of updating their field notes on released manatees as well including Annie, Rocket, and Hurricane released in February this year. The updates aren’t always happy ones. MRP recovered a manatee carcass in July that was identified as Dundee, a calf born in captivity (breeding is no longer allowed), that had been considered a successful release until May when he showed up at Blue Springs State Park in poor condition. A necropsy revealed a huge birds nest of fishing line, leads, weights, and other non-natural items that caused a blockage in the intestines and the male – nearly 22 years old – presumably starved to death. If you’re ever on Florida waters, or you’re an angler, please encourage fellow water-lovers to pick up and recycle monofilament and all other plastic garbage you may come across. I’ve always done it in the past out of my love of clean waterways but now I’ll do it for my love of sadly naive manatees.